The most convenient and most economical variant of the flight will be professionally selected by our specialist. Filled the application in this form – all the rest will be done by our specialist. You can choose the convenient payment method. You can pay for a ticket by cash in office or bank, by credit card. Book information and E-ticket you receiving on your email, or pick up the printed out copy from office. Check the passport and E-ticket before you going to the airport! Business Visit offers a single platform to its clients where the discounts offered by various airlines for diverse seasons, routes and dates can not only be found but also be booked on the Internet. As a significant intermediary across various domains of the travel sector, Business Visit saves money, time and effort of our clients by offering them convenient comparative analysis of different travel options. At the same time, our managers provide the best pieces of advice and tips based on our huge experience to make travel fast and simple. When you are planning a holiday or business trip, one of the most essential things to consider is the air ticket cost, since this price can influence the overall quality of the trip. Although it may seem nearly impossible to find an inexpensive flight ticket booking, you’ll be delighted to learn that it’s actually not so. An ability to book air tickets online means you can do it anytime anywhere. You can buy a pass at home, while you’re working and even when you’re on your way somewhere, via a smartphone. By reserving a travel on the Website, you don’t need to worry about finding a parking spot at the travel agent, waiting in line or feeling pressured to book a ticket on the spot without thorough consideration. Once you book an air ticket on the Internet, you enjoy the freedom to shop around for the best airfare. People don’t get this sort of freedom when booking flights in a traditional fashion. Buying a ticket on the Web means travelers can check out many air carriers prior to making their choice. Book an air ticket on the Internet, and you’ll be able to save a lot of time and effort. All you have to do is to input your data and print out the ticket at office or at your apartment. Even if you leave a printed air pass at the apartment you may have ticket bar code sent directly to your smartphone. Business Visit website helps travelers to book e-tickets. Electronic ticket or simply e-ticket is a digital equivalent of a traditional paper pass. This word is usually related to avia tickets. The electronic ticket structure is a well-organized method of ticket entry, processing, and marketing for air carriers. When reservation is confirmed, the air carrier keeps a record of traveler’s booking in the reservations system. Travelers can print out a copy of an itinerary receipt that includes reservation number and the number of your pass. At the airport, travelers with electronic airline tickets are supposed to check in for their flight in the usual fashion: they provide an e-ticket, their passport, and visa if needed. So, what should be taken into consideration when looking for the best options? Below we provide a few tips to point you in the proper direction. The perfect time for you to look for cheap airline tickets is a few weeks prior to your trip. For a long-haul flight, it is strongly advised to book a ticket as much as 12-15 weeks ahead to be able to avail of the best deal. Often, the converse can apply, with air companies providing online discounts mostly towards the middle of the week, when there’re not so many passengers. Spend some time searching for options before you purchase a ticket, and you’re likely to buy air tickets at the most reasonable price. Dependent on the place of destination and season, even full-service air carriers may be able to provide their clients with very competitive prices. Parents flying with children under eighteen years old are highly recommended to hold papers confirming that the infants are theirs. Parents who are divorced need to prepare legal documentation in order to confirm their custody rights. Also, if a child is accompanied by one parent, it is important to have permission signed by another parent. Children flying with adults having no legal custody over them need to keep letter of travel consent with the signature made by legal guardian or parents. In any case, underage cannot travel alone. Air ticket price will depend on many issues, such as age of a child, separate seat for an infant, and so on. For air ticket prices and air ticket booking, contact Business Visit manager, who will find the most convenient variant for you and your children. Would you like to take extra suitcases or a pet with you? Add this data to the booking information, and, once again, our manager will assist you in searching for the best cheap airfare. After the check-in at the airport, you will receive a boarding pass ticket. 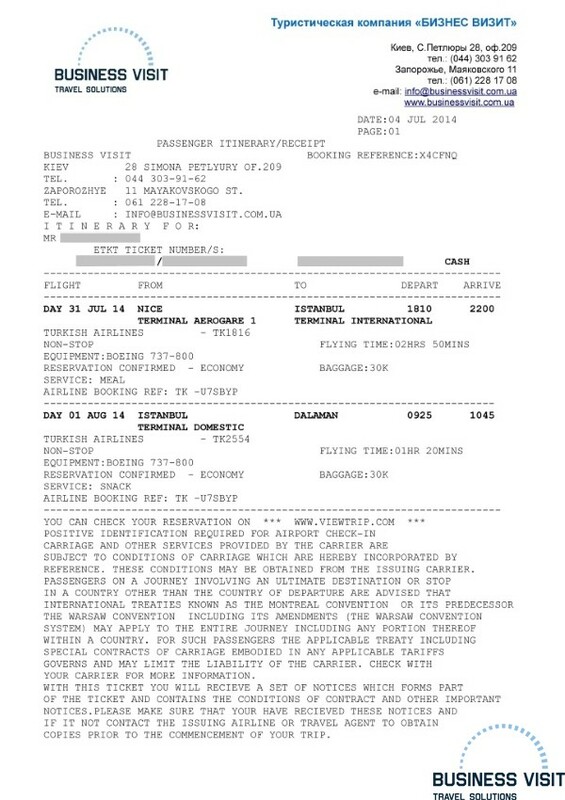 You can see how the boarding pass ticket looks like by click on this photo. Any journey – whether it is a vacation or work trip – is a rewarding experience, and if you choose the booking site properly, flight can be really economical. Gone are those days when tourists had to go to their local agent and settle on a single deal when buying tickets. These days, the Internet is a much more convenient option for travelers to purchase cheap flight tickets. Advantages vary from quick and easy ways to compare prices on different airlines to enabling people to print out their air tickets at home. You can begin to booking a ticket by yourself at any time of the day by using our site. If you can not find right flight or choose the most convenient economical variant of the flight, contact our experienced manager. He will tell you which nearest airport is better to choose, what day of the week, where you can make transfers, which airline will suit you. You will save your time and take advantage of many years of professional experience. Call now by phone in Kyev: +38 (044) 303-9162, in Dnepr: +38 (056) 794-0240, in Zaporizhzhia: +38 (061) 228-1708.